The last year under the Modi Government has seen lot of initiatives in the space of skilling, job creation and most importantly in terms to linking skilling to jobs and taking steps to bridge the gap between talent supply and demand. While it is too early to predict the results of these initiatives, this focus from the top is showing some early positive signs. At least the results from India Skills Report 2017, one of the most comprehensive reports that provides a consolidated view of the talent landscape of India suggest so. 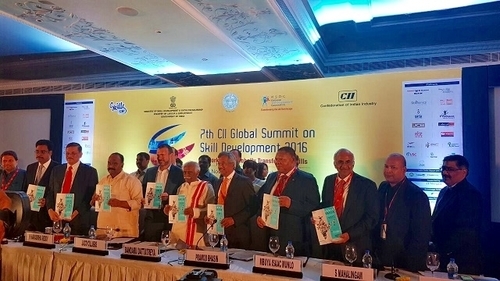 India Skills Report 2017 a joint initiative by Wheebox, Global Talent Assessment Company, PeopleStrong, a leading HR solutions and HR Technology company from India, in Collaboration with Confederation of Indian Industry was launched today by Mr. Bandaru Dattatreya, Hon’ble Union Minister of Labour at CII’s Global Skills Summit in Hyderabad. This initiative is backed by various other renowned partners like LinkedIn, United Nations Development Programme, AICTE, AIU and various State Governments. In its fourth season the report captures the insights from the largest employability test that was spread out to 5000 educational campuses, assessing five lakh students across 29 states and seven union territories from noteworthy educational universities and professional institutes in the country along with the India’s hiring intent survey that reached out to over 125+ employers across 11 major sectors. According to the study, employability amongst the talent pool joining the workforce every year is increasing significantly. While in 2014 the percentage of employable population was at 33% it has increased significantly to 40% this year. This is a decent increase considering that all the initiatives in this space are yet at a very nascent stage. The report also shared that the female candidates seem to be more employable than their male counterparts. Though “employability” here does not include mere domain excellence, but other aspects like communication skills. Logical and analytical ability and several other aspects it is interesting to see women shining in yet another area. There are few interesting insights the report shares at the level of sub-segments. For example allied sectors in telecom, Auto ancillary, Quick service restaurants, Power and energy management are expected to lead the growth in hiring. This brings good news to the candidates who are on a look out for job opportunities. The report also shares that Maharashtra as a state will not only have the highest percentage of employable workforce but it will also see high frequency in hiring in the coming year. However, when it comes to the preferred places to work, Bangalore seems to be the preference for the talent pool, which will start joining the workforce shortly. Mr. Nirmal Singh, Founder and CEO of Wheebox, said “If we look at the current stock of the Skill landscape in India, the situation is alarming. As per India Skills Report 2017, we found out that of all the students entering the job market across the country, hardly 2 out of 5 meet the criteria of the employment set by the employers. The severity of the situation is accentuated by many levels when the economy is looking up, new jobs are getting generated in ecommerce, energy, retail, telecom, hospitality and financial industry; but there are not enough “skilled” people available. Many jobs are getting mechanized and can be managed by a few people and intelligent algorithms then we are heading to a large challenge where many of us do not know the unknown future. We may have plenty of low to moderately skilled people for jobs that may not exist in future”. “The need of the hour is to evangelize the large challenge that is just round the corner. All countries experience demographic dividend once in their lifetime and India’s demographic dividend is just an opportunity for next 25 years, Once gone it will never come again. Though we are late in identifying the opportunity still if we do not prepare ourselves rapidly to reap the benefits” said Nirmal Singh. Mr. Pankaj Bansal, Co-founder and CEO of PeopleStrong, said “The results look positive despite the turbulence in global markets and this surely reinstates the belief that the time of India is here and we are moving in the right direction. It is especially interesting to see a positive hiring intent for the third consecutive year, and also the focus that is expected to increase towards women hiring and entry-mid level jobs." “The India skills report, now in its 4th edition addresses the common goal of quantitatively analyzing the mismatch of jobs and skilled workforce across India. The report is consistently quoted by Industry & Government across forums in India and this is the real testament of its success also for providing the Industry with such comprehensive data of the supply side, that directly helps Industry to hire skilled youth across domains." said Chandrajit Banerjee, Director General, Confederation of Indian Industry. “To meet the demand of human resource for all such initiatives, a close coordination is needed between the Industry and Academia. The India Skills Report will help in understanding the need of Industry and preparedness of youth of this nation to take up the challenge to convert this nation to Unnat Bharat." said Anil D. Sahasrabudhe, Chairman, AICTE.